Tattooed Steve's Storage Unit of Terror: A review of Tim Burton's "Dark Shadows". 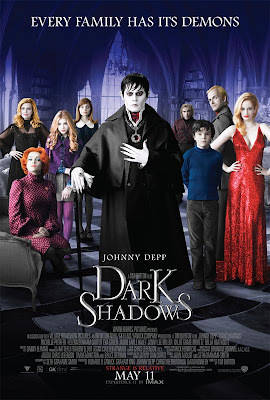 Went to see Tim Burton's "Dark Shadows" today and I really liked it! I've never followed the original Television Series so I don't have any kind of comparison between them (Sorry)... But I can say I do enjoy allot of Tim Burton's movies. The movie definitely had allot of styles from Tim's earlier films (In the settings), but it was a cool kind of familiarity. And a great throwback to his earlier work where it was fun to watch. It had that feel I love were a director says with his creation "Dude, leave all of your aggravation at the door grab a snack and a drink and just hang out here for a few." Tim did a great job with the back story of how Barnabas Collins came to be and flowed into his present situation with saving and protecting his family. And everyone in the cast were completely rock star as their characters. It was cool how the movie was set in the seventies and reminded me why that was my favorite decade ever. You can read all of the intros on the right side of the page here, and just about every one of them have all of my influences from the 1970's that made me the fan and entertainer I am today. And everybody involved in the movie immersed you into that time period so much, that you felt like you were visiting every single Horror movie, Rock Band, Horror Magazine and Horror Comic you were lucky enough to spend some of the best years of your life with for the first time. Even my mother picked up on this and commented to me about it which was really cool. Now she had watched the original series, but she liked the movie allot too. She didn't say anything like "The Show was more... or had..." so I hope that gives a little heads up to the fans of the original Television Series that haven't seen it yet. I guess the only comparison I can make is The Brady Bunch Television Show compared to The Brady Bunch 90's movie. Tim's movie wasn't a mockery of the show like Ben Stiller's movie version "Starsky and Hutch" (Which really pissed me off). Tim's version was more of a tribute maybe as far as a love letter to the series. He may have changed certain aspects to make this his vision of it, but like I said he made a movie where you really cared for and liked the characters and it was cool seeing the family come together when they really needed too. *As a little side note* my mother and I are almost positive that Michael Bruce from the original Alice Cooper lineup is on guitar during Alice's "Event" scene.